Hematopoietic stem cells (HSCs) reside in micro-environmental niches in the bone marrow (BM). Research in recent years has focused on unraveling the different components of the HSC stem cell niche. However, the impact of inflammatory stress on the molecular and cellular basis of the BM HSC niche, and signals exchanged between HSC and niche cells under these stress conditions remain poorly understood. We are investigating how the BM niche responds to inflammatory stress. In the BM, the vascular system consists of a network of sinusoids, arterioles, and transition zones. In addition, BM endothelial cells (ECs) have well-defined roles in HSC function and maintenance, retaining HSCs in culture and contributing to the creation of HSC vascular niches. 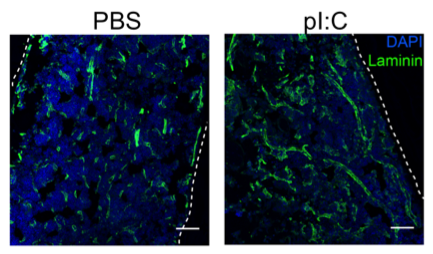 We could show that the BM stem cell vascular niche was remodeled in response to IFNa. IFNa treatment resulted in increased BM vascularity, expression of key inflammatory and endothelial-stimulatory markers on ECs and increased BM vascular leakiness. Using BM chimeric models we could show that BM ECs can be directly stimulated by IFNa, but there is also a strong indirect effect via signaling from IFNa-stimulated HSCs. These data imply a role for HSCs in remodeling their direct BM niche environment following inflammatory stress (Prendergast et al, Haematologica, 2017). IFNa treatment leads to increased BM vascularity. Representative sections of femurs of wt mice treated with the dsRNA mimetic pI:C were stained with Laminin (green) and DAPI (blue). Increased IFNa levels induced a strong increase in Laminin staining in the BM (right image, compared to left). We and others have shown that pro-inflammatory cytokines such as IFNa can lead to the efficient activation of quiescent HSCs in vivo (Essers et al, Nature, 2009). In contrast, under in vitro culture conditions, IFNa has an inhibitory effect on cultured HSCs, leading to a block in HSC proliferation, even in the presence of a supportive feeder layer. These data suggest a role for the BM niche in inflammation-induced HSC stimulation. However, the underlying molecular mechanism for this is poorly understood. Therefore, we focus on unraveling the role of the BM niche in inflammatory stress induced activation of HSCs. 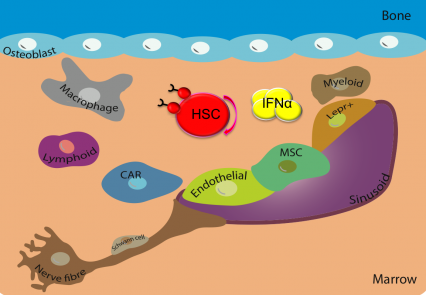 In the BM HSCs are surrounded by extracellular matrix (ECM), connecting HSCs with other structures of the niche, thus being an interesting candidate facilitating communication between HSCs and niche components upon stress. Matrilins (Matns) comprise a family of ECM adaptor proteins that connect different ECM components, forming a supramolecular structure. One of the Matns, Matn4, is highly expressed in HSCs, and the expression anti-correlates with increasing proliferative activity from HSCs to progenitors. Analysis of mice lacking Matn4 showed no apparent hematological abnormalities, thus Matn4 is not required for HSC maintenance and quiescence under homeostasis. In contrast, Matn4 expression is strongly down-regulated in HSCs in response to proliferative stress. Matn4 deficiency resulted in increased proliferation and expansion of HSCs after myelo-suppressive chemotherapy, inflammatory stress and transplantation. Thus, these data suggest that high expression of Matn4 in HSCs confers a resistance to stress stimuli. In situations of acute stress, such as an infection or transplantation, this protection is rapidly lost through down-regulation of Matn4, allowing HSCs to efficiently replenish the blood system. Following on these observations, we are continuing our investigations on how HSCs adapt the ECM directly surrounding them in order to enable proper responses to stress situations.